What Is the Story of The Nance? It’s 1937 New York: Mayor Fiorello LaGuardia is looking to clean up the city before the World’s Fair arrives, and his biggest target is burlesque. 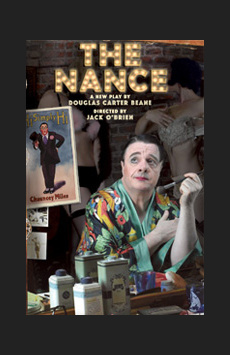 Enter Chauncey Miles (Nathan Lane) and the other stars of the Irving Place Theatre, who find themselves in danger of losing their jobs. Chauncey is a celebrated “nance” performer (a stereotypical gay character in burlesque) and unlike other “nances,” Chauncey is also gay offstage. When he falls in love with a young drifter named Ned (Jonny Orsini), his carefully constructed world begins to crumble. Douglas Carter Beane’s moving new drama follows Chauncey as he struggles to live as a gay man in a dangerous time.